Manila begins to grow as a result of trading activities, with an ever-increasing lack of proportion between Intramuros and the villages growing up beyond the walls. 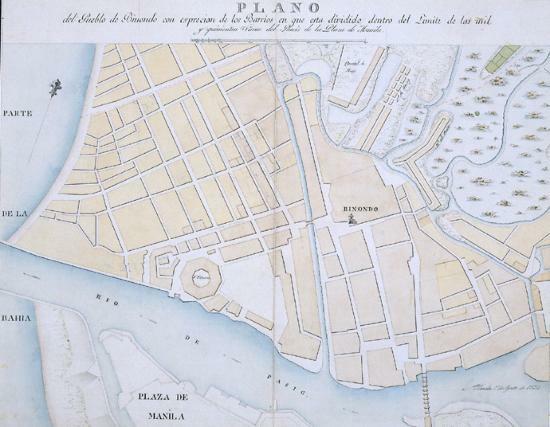 At first, Intramuros was mainly inhabited by the Spaniards, who were known as castilas, while outside the walls other neighbourhoods were established, these being inhabited principally by the natives and other non-Europeans, particularly the Chinese, known as sangleyes, whose trading enclave was the Parian, which was on the same side of the river as Intramuros. 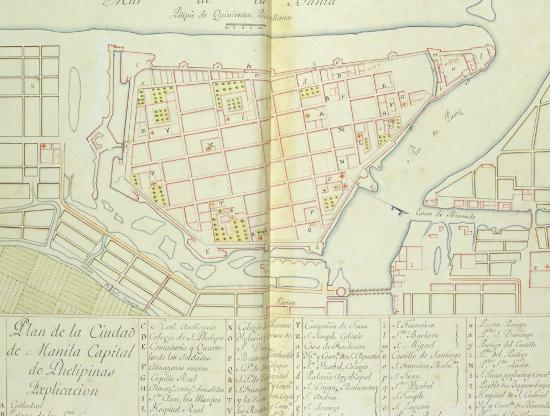 The Parian district eventually disappeared at the end of the 18th century. A new construction, the "Alcaicería" of San Fernando, was then built on the other side of the river, also devoted to trading activities. 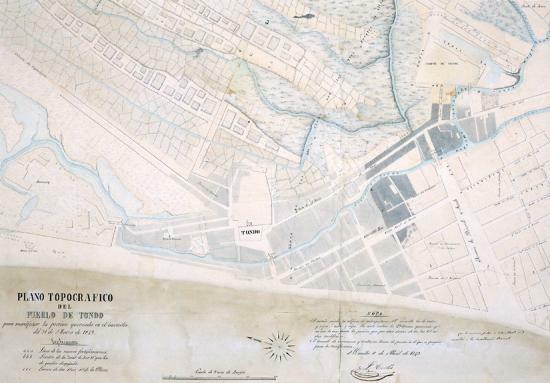 During that period, on the left bank of the Pasig River and to the north of Intramuros, small urban settlements started to develop; these were grouped within the peninsulas formed by the river creeks: Tondo, Binondo, Santa Cruz, Quiapo, San Sebastián and San Miguel. The villages of La Ermita and Malate were established to the south, on the seaboard. Between both these sectors and a little further out, a second ring of villages was established, these were: Sampaloc, San Juan del Monte, Santa Ana, San Fernando de Dilao or Paco and San Pedro Macati. All these small villages, which became districts of Manila in the 19th century, had a building around which they were organized: the parish church, which was practically the only outstanding element beyond the walls up until the 19th century. In addition, and until the 19th century, there was only one bridge connecting the banks of the Pasig River. Manila and its outskirts in 1802. Bernardo de Larse. 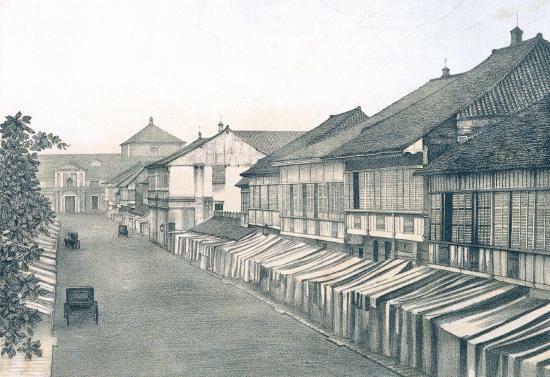 SGE During the 19th century, the Intramuros precinct became a small nucleus set in the middle of the extensive growth of its outskirts, which spread over several square kilometres, and this was the beginning of the extraordinary surface development of Manila. The city of Manila, its contours and its outskirts. Feliciano Márquez. 1767. SHM The most emblematic buildings constructed from stone on the right bank of the river were the barracks of the Luzon Hussars, the public treasury administration building, the tobacco treasury building, several barracks, and the "Alcaicería", which later became the "Aduana" building. "Calle de la Escolta" on the banks of the Pasig River. La Ilustración Española y Americana. 1872. BN Generally speaking, streets were dirt roads. Some were cobbled, but in the rainy season they were difficult to pass along . View of "calle del Rosario". B. Girardier. End of the 19th century. BN The façade of the upper storey of the houses is made of wood, with overhanging balconies closed off with sliding panels whose panes were made from flat, translucent shell -"capiz"-; this material flooded the interior with a warm and welcoming light. "Calle de la Escolta" as seen from San Gabriel. La Ilustración Española y Americana. 1872. BN The "calle de la Escolta" is in the densely populated trading district of Binondo, and was comparable in those-day terms with the "Ramblas" district of Barcelona. 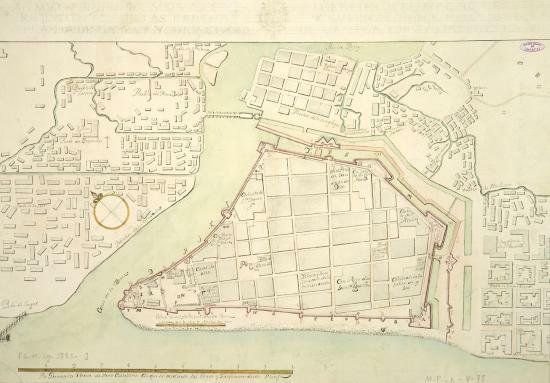 Plan of Manila. Relaci—n de las Islas Filipinas by Fernando Valdés Tamán. 1739. Biblioteca del Palacio Real The least fortified part of the wall was the stretch starting at the San Gabriel bastion, situated at the angle formed by the land front with the river, since it was thought that the river itself provided sufficient defence. Manila and its surrounding area. 1720. AGS A covered roadway was made along the edge of the fosse; this had sufficient height to protect the city wall. The configuration of the "plaza" and the bastions was preserved, and the San Gabriel bastion was made larger to accommodate more cannons. The village of Tondo after the 1843 fire. Tomás Cortés. 1843. 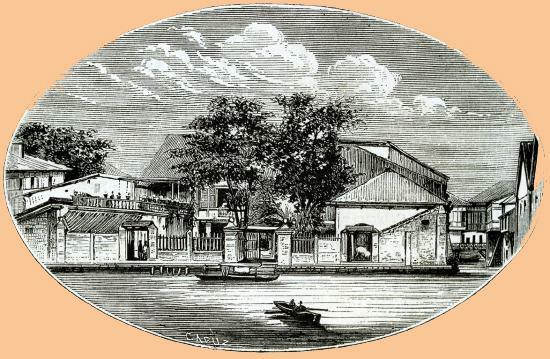 SHM During the 19th century, most of the constructions in the district of Tondo were still made of cane and nipa palm. It had a spacious market square with a church, and in the final years of the century it had a tramway linking it with Binondo. 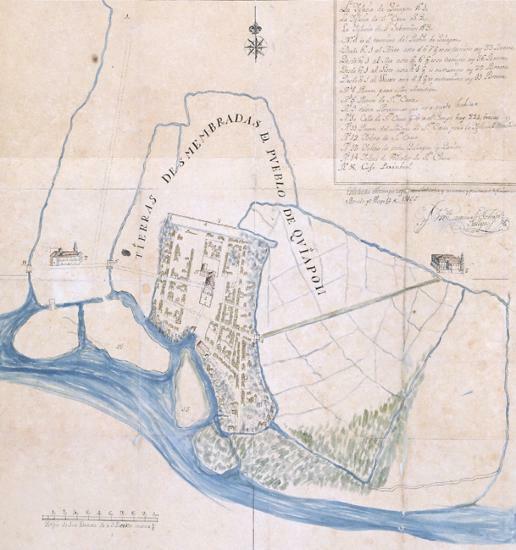 Plan of the village of San Fernando de Dilao. Ceferino Zapanta. 1814. AGI Known at that time as Paco, this was one of the first districts of Manila, where practically all the houses were constructed from cane and nipa palm. This is where the general cemetery for Catholics, with its curious circular shape, was sited. 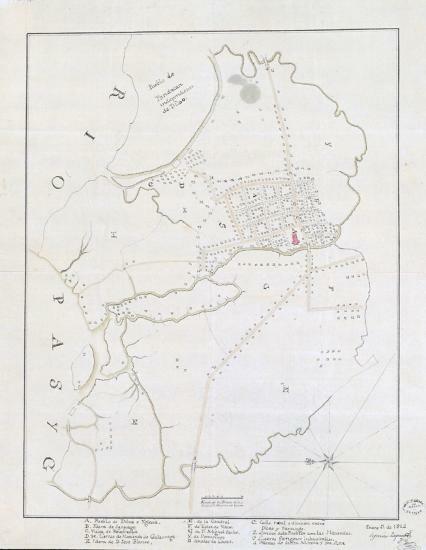 Plan of the village of Quiapo and its area of jurisdiction. Francisco Javier Estorgo Gallegos. 1816. AGI The architecture of the buildings here was based on masonry and wood, with galvanized iron roofing. 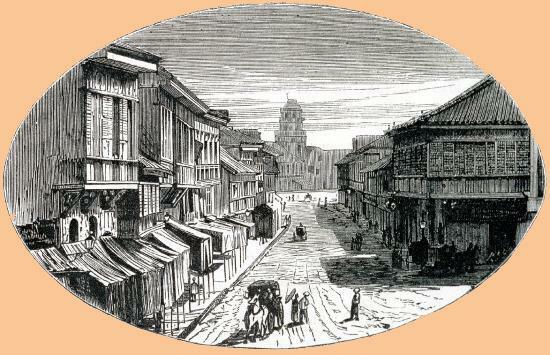 The streets in this district were spacious and housed the wealthy citizens of Manila. The Quinta market was sited here, as was the suspension bridge. The Binondo district in Manila. Juan de Ocampo. 1834. SHM This was the leading trading district in the capital, and its urban features were characterized by very important buildings. It was here that the tobacco warehouses and factories, the treasury administration buildings and several banks were sited.